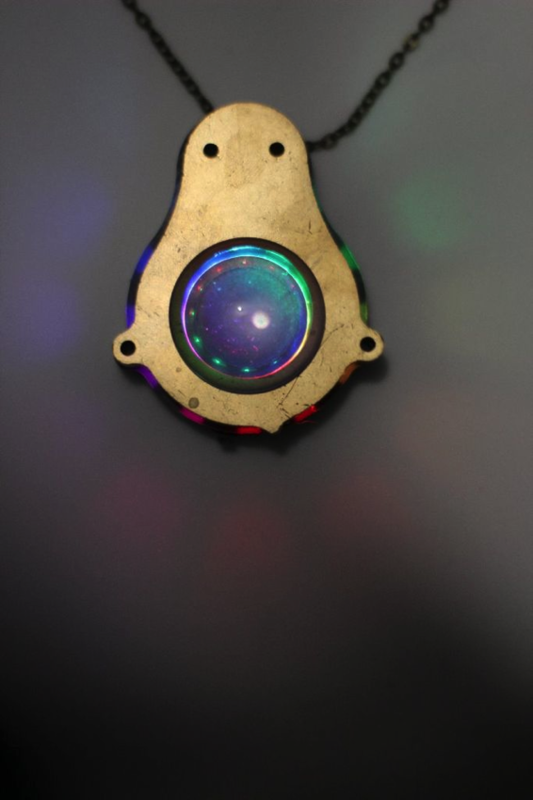 8 #Wearables Made with Othermill #WearableWednesday « Adafruit Industries – Makers, hackers, artists, designers and engineers! 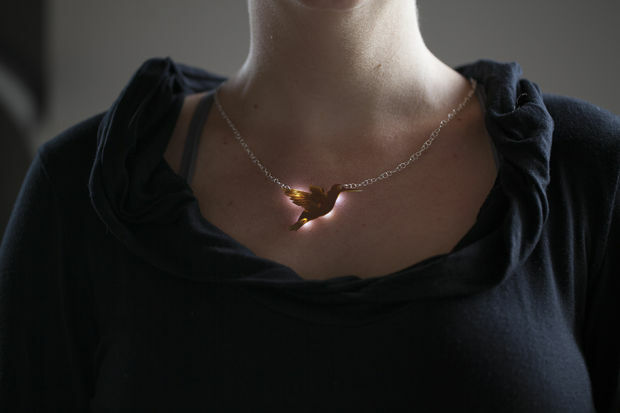 You can make all kinds of chic adornments with a small milling machine like the Othermill, both with electronics and without! Here are some of our favorites. The necklace has four LEDs on the back of the pendant that provide a beautiful glow around the outline of the pendant and highlight the pattern on the front of the necklace by illuminating the etched traces. This tutorial gives you two design options: a blank, solid copper front or a bird feather pattern on the front. 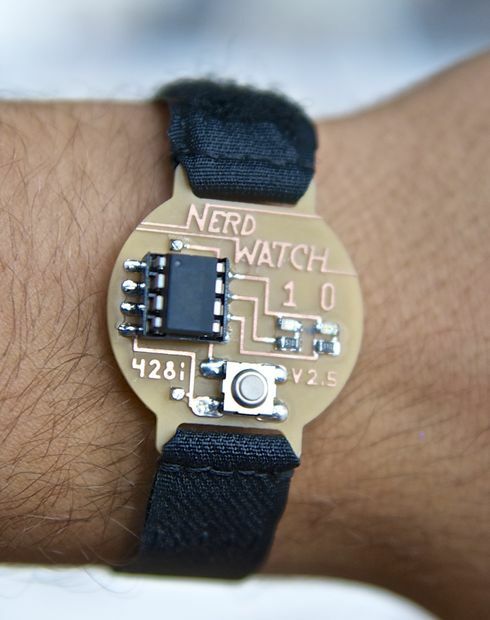 The Nerd Watch displays the time in binary when the button is pushed. The watch shows the hour and minutes by flashing two LEDs in sequence to represent two 4-bit binary numbers (in big-endian format). I’ll show you how to build a Nerd Watch from scratch with a few electronics components and an Othermill. 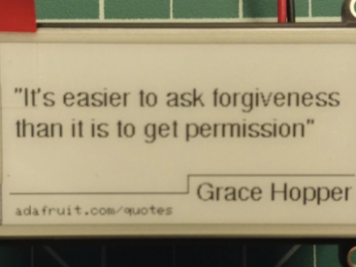 This is a prototype for a secure enclosure and substrate for creating jewelry with Adafruit’s NeoPixels and Gemma microcontroller. The design is intended to provide an adaptable platform for diffusing, directing and modifying the light and colors emitted from the addressable LED NeoPixels. Are you tired of boring name tags?! Do you want to make something awesome and fun with the Othermill? Look no further! In this Instructable, we will show you how to use the Othermill to make a circuit board and an aluminum faceplate with your name cut out of the center. An auto-color-changing RGB LED on the circuit board will illuminate the letters of your name from within, and everyone will come talk to you. Cloisonné is an ancient and venerable art. Traditionally, it involves meticulous placement of tiny strips of wire on a metal surface, creating gaps that are then filled with cut stone, enamel powder, or paint. Cloisonné can be used to enrich almost anything, but it’s most commonly used for jewelry, decorative art pieces, and small useful things like boxes and vases. The end result is always gorgeous. 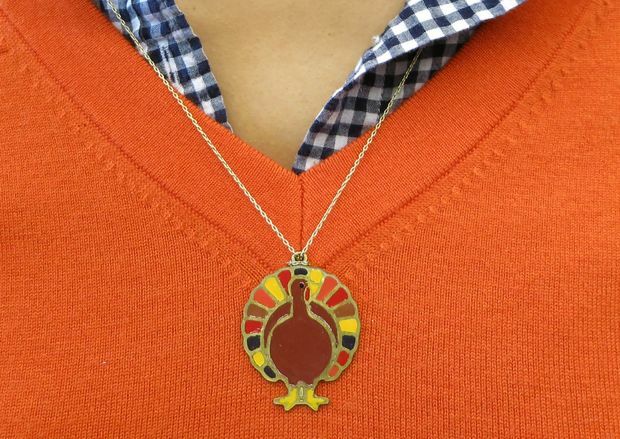 Here’s a way you can create cloisonné on the Othermill desktop CNC mill, from scratch, with just a trip to the hobby store and a few spare hours. 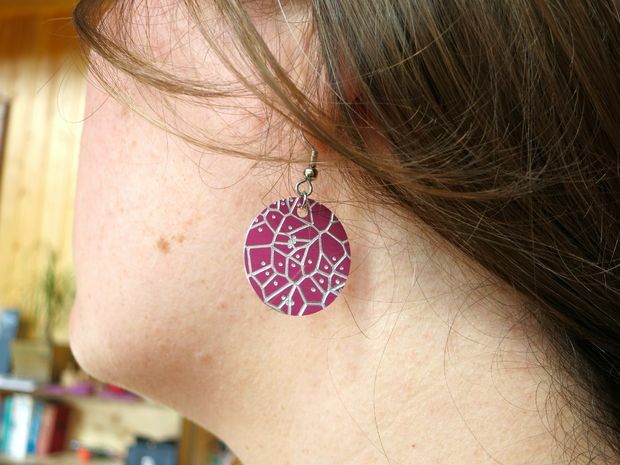 In keeping with the spirit of making things on the Othermill that are not circuit boards, we were playing around with engraving anodized aluminum when we thought we could do one better and make earrings. Here’s a quick rundown on how we did it.